What’s your kiss personality? Unlock the hidden messages of your lip print with Vita Perfetta Lipstick Readings. Are you a funky diva, posh trendsetter, or Zen and carefree? Is success written all over you? Kiss the card and find out! Our talented lipstick reader uses the unique lip print of each party guest to give amazingly accurate and detailed personality readings. 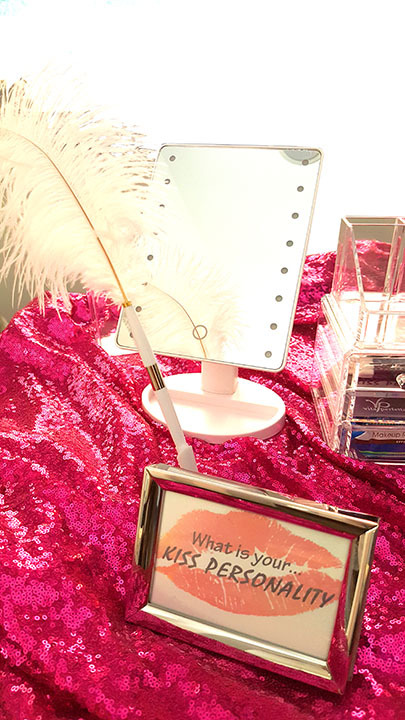 Just choose one of our funky lipstick colors, pucker up and kiss the lip print card. Party guests will go wild as they learn all of their gifts, talents, and quirks. Create an experience your guest will never forget with Vita Perfetta Lipstick Readings.